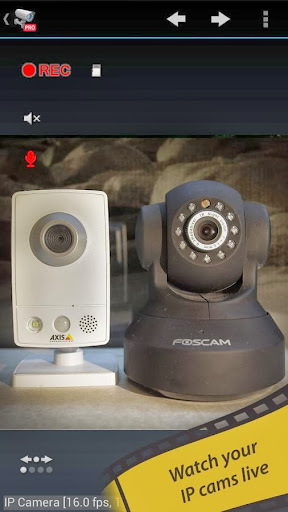 tinyCam Monitor PRO for IP cam v6.1.6 – One of the best apps available for Android for remote surveillance, control and video recording for your private/public network or IP cameras, video encoders and DVRs with CCTV cams (100,000+ active users). Monitor your baby, pet, home, business, traffic, and weather remotely and securely (no data being sent to 3rd parties). tinyCam Monitor provides best value to customers. Buy now to get more features in future updates for free! More than 25 major updates per year with new features! – Intuitive custom made interface. See the screenshots to appreciate the quality of the app. – H.264 codec (SW and HW) support for FOSCAM 2013 models (FI9821W, FI9826W, FI9831W, etc.). – 2-way audio (talking and listening) for Axis, FOSCAM, Apexis, Loftek, Tenvis, Wanscam, Wansview, INSTAR, and more on the way! – 1-way audio (listening) for D-Link, Edimax, Gadspot, Panasonic, SONY, Sharx Security, TRENDnet, Y-cam (selective models). – SSL support (HTTPS protocol) for secured monitoring and encrypting credentials (digest authentication). – Control PTZ (pan-tilt-zoom) enabled devices, i.e. Pixord, Vivotek. – MP4 video recording (Android 4.3+) and cyclic 24/7 image recording (sequence of JPEG images) on SD card, FTP server, or Dropbox. – FTPS protocol support for encrypted FTP image uploading. – On-camera motion detection for Hikvision, VStarcam, Wanscam, Sricam. – Support for special characters in password for ONVIF and RTSP cameras. – Low-bandwidth profile for ONVIF. – Fixed broken video recording with audio for Android 4.3/4.4.